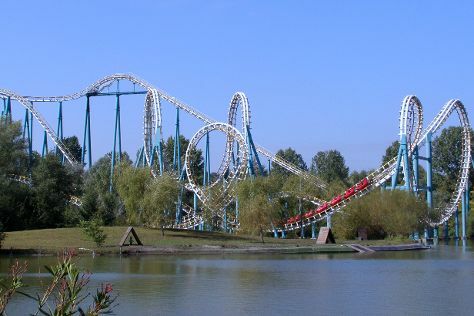 Start off your visit on the 6th (Tue): get in on the family fun at Parc Asterix. For traveler tips, more things to do, where to stay, and tourist information, use the Plailly trip itinerary tool . Shannon, Ireland to Plailly is an approximately 9-hour flight. You can also drive. Due to the time zone difference, you'll lose 1 hour traveling from Shannon to Plailly. When traveling from Shannon in August, plan for somewhat warmer days and about the same nights in Plailly: temperatures range from 28°C by day to 17°C at night. Wrap up your sightseeing on the 6th (Tue) early enough to drive to Amiens. Start off your visit on the 7th (Wed): contemplate in the serene atmosphere at Cathedrale Notre-Dame d'Amiens, then identify plant and animal life at Les Hortillonnages d'Amiens, then take a stroll through St-Leu, and finally take an in-depth tour of Maison de Jules Verne. Keep things going the next day: explore the different monuments and memorials at Australian War Memorial, examine the collection at Musee Somme 1916, steep yourself in history at Beaumont-Hamel Newfoundland Memorial, then take in the history at Thiepval Memorial, and finally steep yourself in history at Lochnagar Crater. For other places to visit, maps, more things to do, and other tourist information, use the Amiens trip builder app . You can drive from Plailly to Amiens in 1.5 hours. Alternatively, you can take a train; or take a bus. In August, plan for daily highs up to 26°C, and evening lows to 15°C. Finish your sightseeing early on the 8th (Thu) so you can take a train to Lille. On the Deûle River near the Belgium border, Lille has a very active cultural life as France's fifth-largest metropolitan area and the fourth-largest urban area with a large college student population. Kick off your visit on the 9th (Fri): admire the masterpieces at Le Palais Des Beaux Arts de Lille, test your problem-solving skills at popular escape rooms, then get your game on at Le Waf, and finally appreciate the history behind Monument et Parc commémoratifs du Canada à Vimy. Keep things going the next day: admire nature's wide array of creatures at Lille Zoo, then take a stroll through Vieux-Lille, then make a trip to Grand place, and finally identify plant and animal life at La Z'Ane Attitude. For traveler tips, more things to do, other places to visit, and tourist information, you can read our Lille travel route builder tool . Traveling by train from Amiens to Lille takes 1.5 hours. Alternatively, you can drive; or take a bus. In August, daytime highs in Lille are 27°C, while nighttime lows are 15°C. Cap off your sightseeing on the 10th (Sat) early enough to travel to Bray-Dunes. Bray-Dunes is a commune in the Nord department in northern France, located on the Belgian border. On the 11th (Sun), look for all kinds of wild species at Dune du Perroquet, enjoy the sand and surf at Plage de Zuydcoote, and then identify plant and animal life at Reserve Naturelle Dune Marchand. Ask Inspirock to suggest an itinerary and make planning a trip to Bray-Dunes fast, fun, and easy. Traveling by car from Lille to Bray-Dunes takes 1.5 hours. Traveling from Lille in August, you will find days in Bray-Dunes are little chillier (24°C), and nights are about the same (15°C). Finish your sightseeing early on the 11th (Sun) to allow enough time to travel to Boulogne-sur-Mer. Kick off your visit on the 12th (Mon): stroll through Le Touquet Beach. On the 13th (Tue), you'll have a packed day of sightseeing: look for all kinds of wild species at Parc du Marquenterre, then identify plant and animal life at Les Phoques de la Baie d'Authie, and then identify plant and animal life at Dune de l'Authie. To find more things to do, ratings, other places to visit, and more tourist information, read Boulogne-sur-Mer online trip itinerary maker . Traveling by car from Bray-Dunes to Boulogne-sur-Mer takes 1.5 hours. August in Boulogne-sur-Mer sees daily highs of 24°C and lows of 15°C at night. Wrap up your sightseeing by early afternoon on the 14th (Wed) to allow enough time to travel back home.